Before the 1870’s, sanitation was a huge problem in the growing world. Doctors would clean tools with wine or hard alcohol, people’s teeth were falling out from not cleaning them, and people were getting infections from surgery at an alarming rate, etc. Since so many surgeries resulted in infections, they then had to amputate that area. Amputations had a 45-50% success rate. This all means that if you needed surgery, you probably would die. 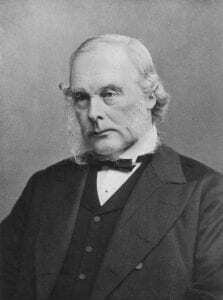 It wasn’t until many advances in microbiology that Joseph Lister introduced Carbolic Acid as an antiseptic in medicine. He discovered that it cleaned surgical instruments extremely well, and prevented many infections from surgery. This discover made the maternal death rates drop from 18% to 1%. Later, another antiseptic, Listerine, was made by another scientist for a general sanitation, in which it was named after Lister, the father of antiseptics. You might be thinking, “All of this happened in the past, and our antiseptics are so good now, why do should I care?” As it turns out, modern antiseptics don’t actually sterilize things 100%, and although they do a pretty good job, and there are still new antiseptics being discovered every year. One of these recent discoveries is an antiseptic for caesarean deliveries. A new solution of Chlorhexidine and alcohol (2% chlorhexidine gluconate with 70% isopropyl alcohol) cuts cesarean section surgical site infections by half compared with the usual solution of iodine and alcohol (8.3% povidone-iodine with 72.5% isopropyl alcohol). Dr. Methodius G. Tuuli, who is a professor at Washington University in St. Louis, is responsible for this amazing discovery and has spoken at the Annual Pregnancy Meeting sponsored by the Society for Maternal-Fetal Medicine, and had his work published in the New England Journal of Medicine. The experiment itself consisted of 1,147 patients who delivered a baby through a c-section. The doctors then randomly used either the new solution or the old alcohol/iodine solution. Besides that, nothing else changed in the procedure for postpartum women; and then 30 days after being discharged from the hospital they were given a call to see if the surgery site had developed an infection. The only downside that is known about Chlorhexidine, is that it supposedly causes more allergic reactions than the iodine solution; however none were observed during the experiment. Antiseptics are often overlooked when it comes to the best inventions or discoveries in science because it is so mundane. People never stop and think what life was like before we had all these amazing soaps and sanitary solutions. To me, it is mind-blowing that less than 150 years ago, if a person needed surgery on any of the limbs, the odds are they would probably get an infection, then have to get it amputated, which gave them a 50% chance to live. Do you readers agree that Antiseptics have been our greatest discovery? Let me know in the comment below!